HAGEL: We have troops in Iraq. You know that. I know that. Senator McCain knows that. What I know and McCain knows is we don't have enough troops. What are you going to do about troops, I mean to say adding more troops? Can you give this committee some specifics? Of what you've stated, you framed clearly. I think we understand what you've said. I support what you're talking about, your objective. But how will that change from what we have been doing? Fewer troops? Less troops? More NATO troops? Or what will envision the change in what you're anticipating our role to be and connect that to an exit strategy? RICE: You are aware that I am nominated to be Secretary of State not Defense right? HAGEL: Might I point out that the goal here is quality face time. You are aware that I am not interested in your answers? SARBANES: I think the secretary who adopts a unilateralist approach in the international environment may miss important opportunities to prevent conflicts and to build alliances. And in that regard I just note that it's not enough to have the ear of the president. I think the secretary of state must also win the ear of the world. Are you going to make friends abroad? RICE: I already know an awful lot of people and until one of them dies I couldn't possibly meet anyone else. SARBANES: Well okay then, let's talk about economics. I mean to say, it's pretty apparent what's happened here: an incredible deterioration in recent years in the U.S. trade deficit, and it's estimated that we're now running well over $600 billion a year; by far the largest trade deficit in our history. RICE: You are aware that I am nominated to be Secretary of State right? SARBANES: They've got a name for people like you Condi. That name is called "recidivism." Repeat offender. Not a pretty name, is it Condi? RICE: No sir. That's one bonehead name, but that ain't me anymore. SARBANES: You're not just telling us what we want to hear? RICE: No sir, no way. SARBANES: 'Cause we just want to hear the truth. 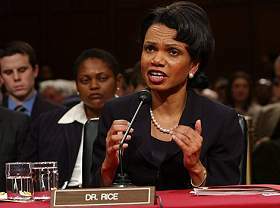 RICE: Well, then I guess I am telling you what you want to hear. SARBANES: Girl, didn't I just tell you not to do that? 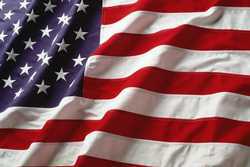 KERRY: I say to unto you I understand more than a few things about the resistance we are facing in Iraq. I mean to say, I have recently met with some important European leaders. You're describing for me the different groups of terrorists. I know who they are. I have served two tours on the Senate Intelligence Committee, so I am well informed. Some of them are criminals. Some are jihadists. Some of them are the former Baathists. Some are them are Zarqawi. Some of them are former members of boy bands. We understand that. The question I asked you is: What are you going to do -- why have we rebuffed the efforts of others to be involved, Russians, Indians offered peacekeepers -- rebuffed. The U.N. offered at a point in time. There have been a series of offers here and we keep, sort of, making this decision to rebuff. And there's a frustration out there in the global leadership that's sort of wondering, you know, whether we're going to change that rebuffing dynamic and bring them to the table in a legitimate way. RICE: But, Senator, the only reason that I rehearsed who we're fighting is that there seems to be some confusion in that regard, and we don't need to bring people to the table, we need people that are willing to push away from the table and actually do something. RICE: Yes, that is absolutely correct, they could do more. BOXER: So in your statement, it takes you to page three to mention the word Iraq. Then you mention it in the context of elections, which is fine. But you never even mentioned indirectly the 1,366 American troops that have died or the 10,372 who have been wounded, many mentally. RICE: I can rearrange my statement before it is entered into the record if you like? BOXER: Well, you should you read what we voted on when we voted to support the war, which I did not read, but most of my colleagues did. It was WMD, period. That was the reason and the causation for that particular vote. But again, I just feel, you quote President Bush when it suits you, but you contradicted him when he said, Yes, Saddam could have a nuclear weapon in less than a year. You go on television, nine months later, and said, Nobody ever said it was going to be all WMD's and stuff. RICE: Senator, that was just a question of pointing out to people that there was an uncertainty, that no one was saying that he would have to have a weapon within a year for it to be worth it to go to war. BOXER: Well, if you can't admit to this mistake, I hope that you will rethink it. RICE: Senator, we can have this discussion in any way that you would like. But I really have to know, what is up with your hair. Did you just roll out of the rack? Is rode hard and put up wet in style now? BOXER: I'll have you know that this hairstyle focus grouped well with my base.